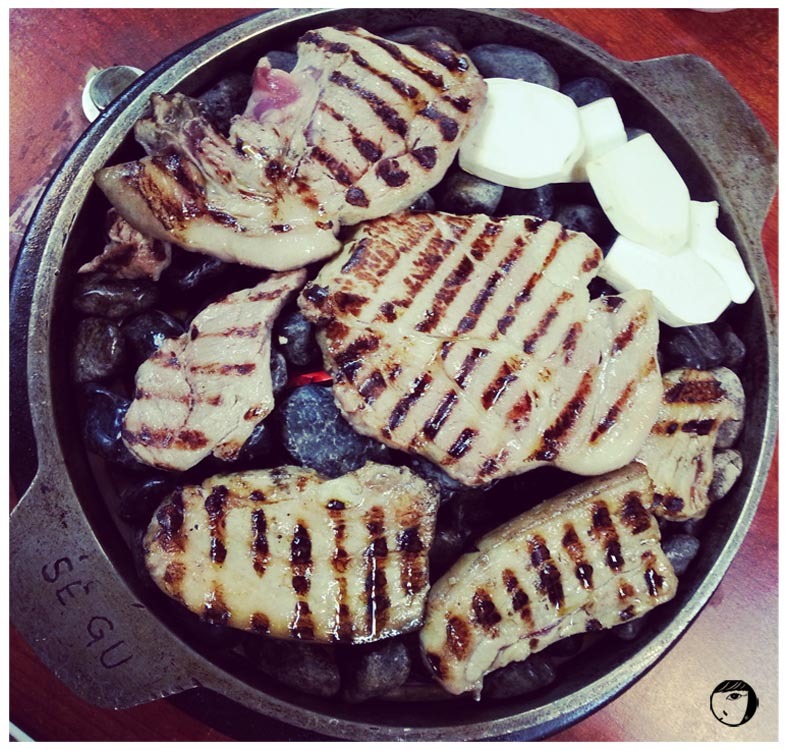 One of my favourite BBQ places is ‘수정옥돌 생소금구이’ or Sujeong-ogdol Saeng Sogeum-Gui / Fresh Grilled Salted Pork BBQ. The shop is located just side by side with Hongik Sutbul Galbi or ‘홍익 숯불갈비’ (another favourite BBQ place of mine). Their speciality is their chewy salted pork meat. Another uniqueness on this place that attracts me is the meat is not grilled on the normal grilling pan. BUT ON THE STONES! The owner recommended us to try their speciality : the salted pork meat. They also have other kind of meat. Although the menu are in korean hangul, the ahjumma will offer you an english menu if you are a foreigner. 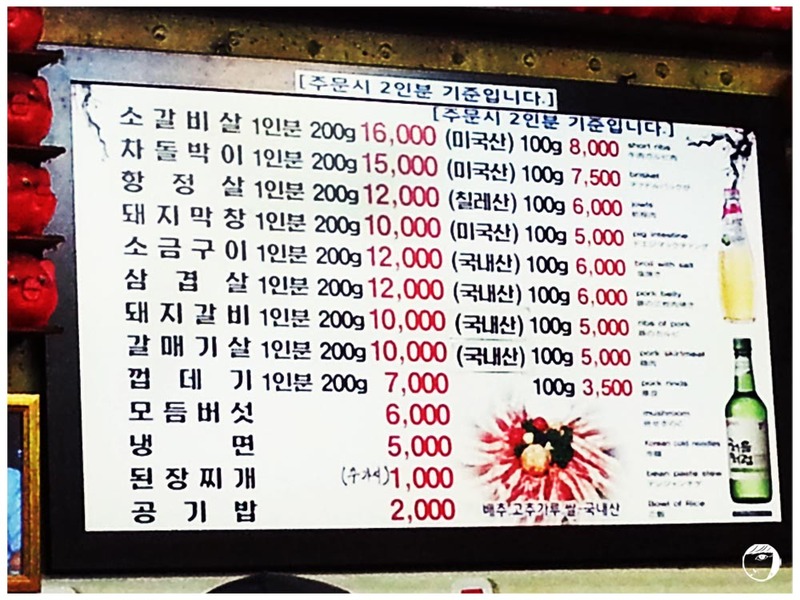 We ordered their speciality the salted pork meat or sogeom-goi / 소금구이. 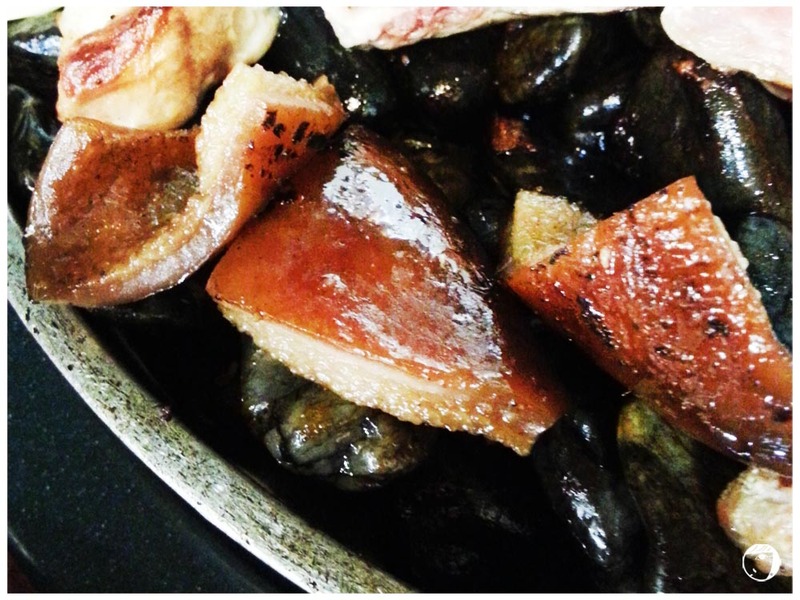 We also ordered pork belly meat or usually known as samgyeopsal / 삼겹살, pork skin or kkeobdeigi / 껍데기, and pork skirt meat or galmaegisal / 갈매기살. 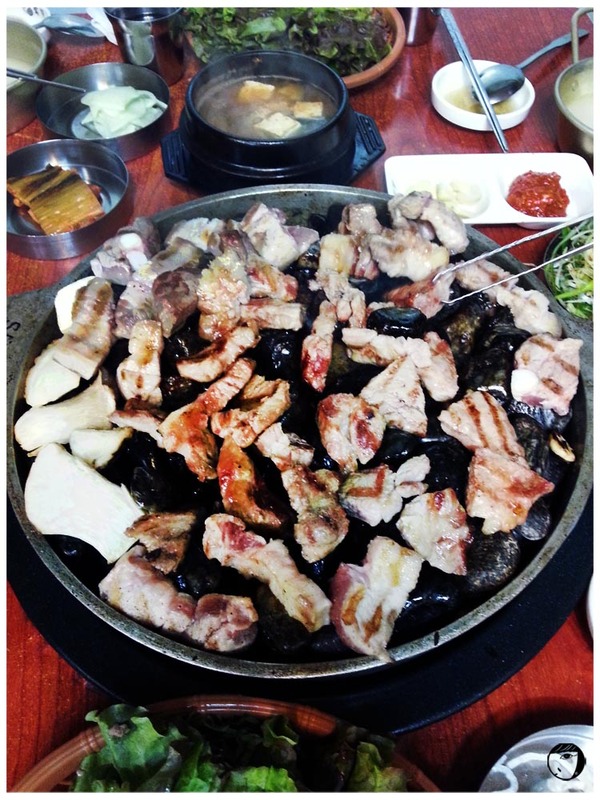 Once we ordered, the ahjussi brought out the pan filled with stones and the raw meat. The meat cooked well in time. See how the meat are perfectly cooked on these stones. So delicious! The sogeum-gogi is very chewy and the meat just perfectly melt in your mouth. 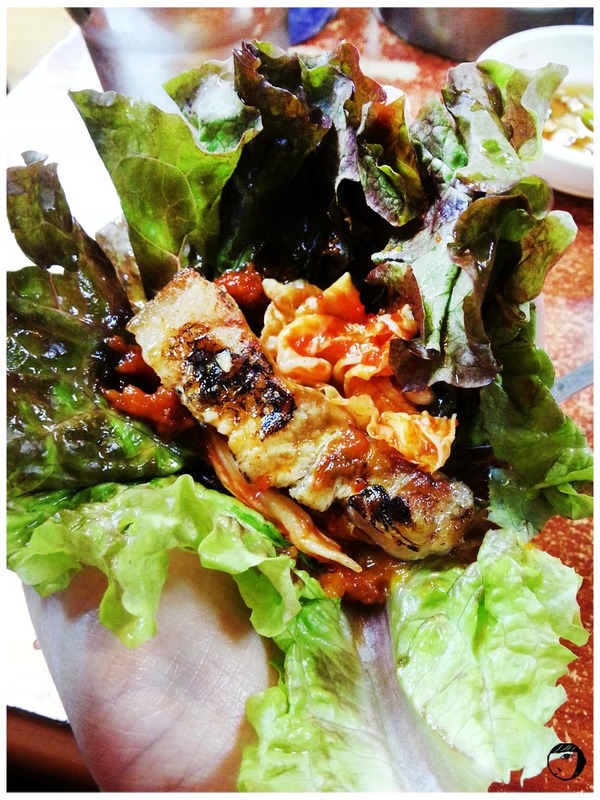 Of course, the perfect way to eat meat is to wrap it with lettuce with kimchi and the chilli paste. My Korean friend ordered pork skin or kkeobdeigi / 껍데기. Different from Chinese charsiew style pork skin which is crunchy, kkeobdeigi is chewy and sweet. If you haven’t tried kkeobdeigi, you should try it. Watch out while grilling these fellas, because they ‘jumps‘ (you will know what I mean by jump once you try). After you finish your meal, they will serve a sweet cinnamon punch drink with a herbal medicine for free. The herbal medicine will help to cleanse your digestion. And the punch drink is really good to cool down the heat after eating a lot of grilled meat. Overall, for me the samgyeopsal at Hongik Sutbul Galbi (next shop) is better. But if I were craving for a salted grill pork meat, I will come here to have fresh and chewy sogeom-goi / 소금구이. – Take subway to Hongik University Station (Green line, line 2) and take exit #8. From the exit, take the turn right. Go straight passing Coco Bruni Cafe and Black Smith. – Once you reach the convenience store (when I wrote this, it is C&U convenience store) at the corner of the second intersection. You will see a rotary, walk across to the left side. Then keep walking straight until you see the second rotary. On the right side, on the corner of the small street, you will see this restaurant with white signage with red hangul writing ‘생소금구이’ and green door (next to Hongik Sutbul Galbi which has yellow signage).